Muffin had a wonderful time last Sunday at our local church's little festival. 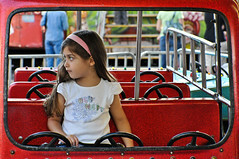 The only ride she wanted to do was riding cars, guess what car she's "driving" in this picture? She also wanted to play a froggy splash game - you put a rubber frog on a contraption, hit a lever with a mallet, and the froggy flies into a pond full of moving plastic lilly pads. If your rubber frog lands inside, you win a plush frog. So now we have a new Froggy at our home, and Muffin has been busy taking care of him - feeding him 'flies', and making sure he takes naps and goes to bed on time. Very cute! !